With more than 70% of all hydraulic system failures caused by fluid contamination, it is the number one source of hydraulic or lubrication system breakdown. These breakdowns lead to decreased productivity as well as costly component and fluid replacement. Widely used in construction, military, agricultural, automotive, marine, shipping, excavation, avionics, manufacturing, oil and petroleum, paper and pulp, mining, milling and waste removal industries among others, it is important that hydraulic pumps, motors and cylinders be properly maintained by way of filters in order to avoid costly and potentially dangerous mechanical failures. Though systems vary considerably, the basic process is similar in most liquid filters. The hydraulic fluids, chemical compounds composed of oils, esters, silicon, mineral oils, water and other composite materials, are drawn through a semi-permeable, porous or chemically activated filter media. The liquid molecules pass through this membrane while suspended particulates and chemical contaminants are inhibited. Hydraulic filters should be used even with new hydraulic fluid as it is processed and put into a given system. Often manufacturing processes result in the introduction of contaminants such as metal filings, burrs, tape, sand and other contaminants. 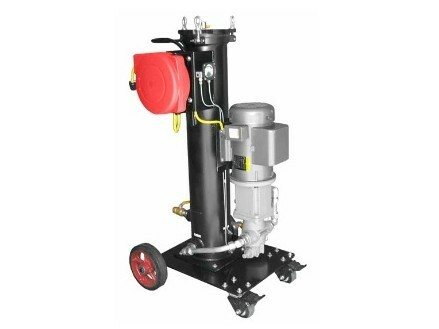 As the operation of hydraulic equipment as well as environmental contaminants such as dirt are also common, in-line filtration is likewise important. Filtration products for hydraulic systems may be purchased in media only, housing only or complete filter assembly configurations. Bulk filter media is the actual mat, barrier or chemical that traps, dissolves or contains impurities. Common materials include wire mesh, fiberglass, cellulose, paper, activated clay or carbon and other synthetic and organic fibers. The housing is the holder or frame responsible for keeping the filter media in place. This element is more commonly composed of durable materials such as aluminum, PVC, steel and stainless steel. Filter assemblies include both the housing and the media. Common choices for hydraulic applications include in-line, tank-mounted, spin-on, duplex, off-line or recirculation, pressure, return-line, breather and suction. The technology used to implement the filters may be full flow, full flow bypass, and proportional or partial flow. The names describe the amount of fluid that actually passes through the filter during operation. Full flow hydraulic filters force all fluid through filter media, eliminating virtually every opportunity for contamination. Full flow bypass filters divert some of the fluid when the filter becomes clogged. Proportional hydraulic filters run only a variable amount of fluid through the filtration apparatus at any given time. As improper hydraulic filtration can reduce product efficiency as much as 20%, it is important to select the proper filter for a specific application. Hydraulics and filtration professionals can provide helpful insight into product selection. Hydraulic Filters Hydraulic filters are liquid filtration devices designed especially to remove and eliminate contaminants and impurities from hydraulic fluids.